It is at this point my friends often say, “Sounds good, but I have no extra money to save.” As millennials, we have a lot on our plates – student loans, high rent, credit card debt, and a higher cost of living. It seems nearly impossible to find a way to save! 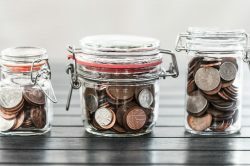 However, common employer benefits, tax-sheltered accounts, and new technologies have made it easier than ever to make saving a conscious habit. The most important part is to just get started. Take advantage of employer-sponsored retirement plans: Many companies offer employer-sponsored retirement plans. 401(k)s and Roth 401(k)s are two examples. These plans often include an employer match up to a certain percentage of your contribution. Saving the maximum amount of matching available ensures you get the most out of your benefits and is a great financial habit to develop. In short, not taking advantage of an employer match is essentially throwing free money out the window. Also, if you ever leave the company you can take your plan with you to your new employer’s retirement plan or roll it over into an IRA. Make small savings a habit: Start by tracking your monthly expenses (food, clothes, gas, etc.) and look for areas where you can cut back (premium coffees, lunch, Uber, etc.). You will still be making the same salary, but your expenses will have dropped. Then open a linked savings account and transfer the small amounts of money you were spending to this account. There are many apps to help with this concept of consistent, small savings. Most are free to download and will help you find areas to budget more efficiently and to automatically transfer savings to a separate account. Open a tax-advantaged account: Once you have the habit of saving down, open a tax-advantageous savings account like a Roth IRA or Traditional IRA. A Roth IRA allows you to make after-tax contributions with the benefit of tax-free withdrawals after age 59 ½. A Traditional IRA allows you to receive tax deductions and tax-deferred growth until your retirement years. Both accounts offer many benefits and can be great vehicles for retirement saving. Seth Catanese is an Assistant Financial Advisor Manchester Financial, an Investment Counsel/Wealth Management firm located in Westlake Village. For more information call 800-492-1107. This entry was posted in Financial Planning and tagged Budget, finance, millennial, millennial investing, millennial money, personal finance. Bookmark the permalink.